As promised, here's the second half of the day's news! Today's Weekly Famitsu feature is much longer than usual, with a recap of all of the previous news and only a few new details scattered throughout. 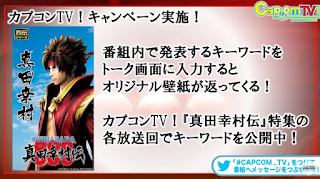 The oni costumes we saw yesterday are confirmed to be paid DLC for the Sanada clan members: Sanada Yukimura (Red Oni Ver. ), Sanada Masayuki (Green Oni Ver.) and Sanada Nobuyuki (Blue Oni Ver.). They're supposed to give the characters a mystical feel, and the weapon graphics change along with the costumes. All of the playable characters have alternate outfits (as well as the story outfits we've seen so far). They're all recolours rather than true second costumes, but they're reasonably fun. Yukimura's alternate outfit is a camouflage-coloured version of his classic outfit, Sasuke-style. Masayuki has a white costume with a bright red rose. Nobuyuki's is dark grey/black with some red trim. It looks good. Masamune has a black and crimson version of his new white costume with gold trim. Benmaru is dressed in yellow with red/blue details, a little like his father's standard outfit. Bontenmaru is wearing a crazy blue/white/pink marbled recolour of his standard costume. Chapter 9 is titled Osaka Summer Siege: Azure-Crimson Chance Encounter, and it's the duo's fated battle in their classic outfits. 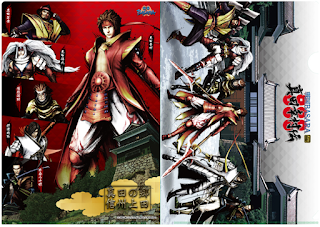 Chapter 10 is simply called Osaka Summer Siege: Sanada Yukimura, and it seems that Tokugawa Ieyasu is the final boss. Yukimura is wearing his Phoenix costume. The Setting Sail From Setouchi 'Secret Backstory' stage was also featured for the first time. It's set between chapter 8 and chapter 9 as I guessed, and the player takes control of Yukimura for an intrusion in a fight between Motonari and Motochika. It looks like a proper stage with objectives (Akatsukimaru even shows up) rather than a simple duel. (Edit: My mistake, these shots are from chapter 9. The side story is a fight with Motochika). They're still keeping a few of the Secret Backstories hidden even though some were visible in a screenshot already. It seems extremely likely that each of the four adult characters only has one (R2?) special move in this game, since the text makes a big deal out of Yukimura earning his Fuurinkazan move over the course of the story and explicitly omits the two child characters when describing the new specials. Oh well. The text also implies that Monsen Coins are only used for levelling up and buying Styles. There's an interview with Nishikawa Takanori (T.M.Revolution) in which he makes song recommendations from the DLC music packs you can buy for the game. He suggested Madan ~Der Freischütz~ for playing a character with a gun like Magoichi, but wasn't so sure about HOT LIMIT or HIGH PRESSURE. By the way, the reason that I haven't been talking about the game's placement in the usual Weekly Famitsu ranking of upcoming games all this time is that it hasn't been appearing, so I'm not expecting it to sell spectacularly well. Sengoku Basara: Sanada Yukimura-den is very much a spin-off rather than part of the main series, after all. 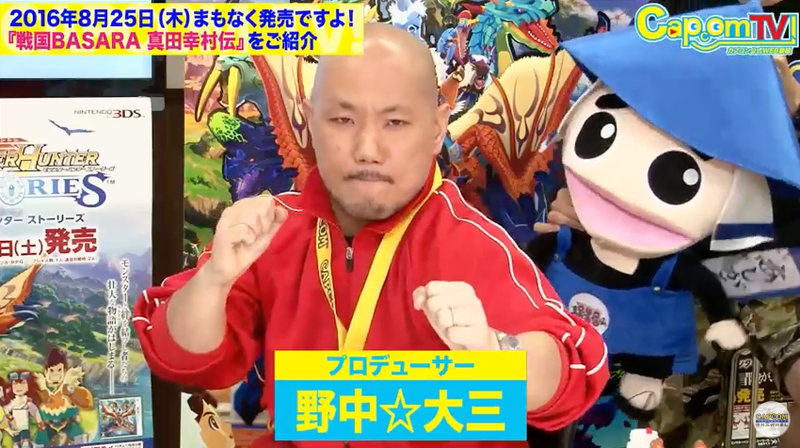 There's not much to say about today's Capcom TV, as expected. 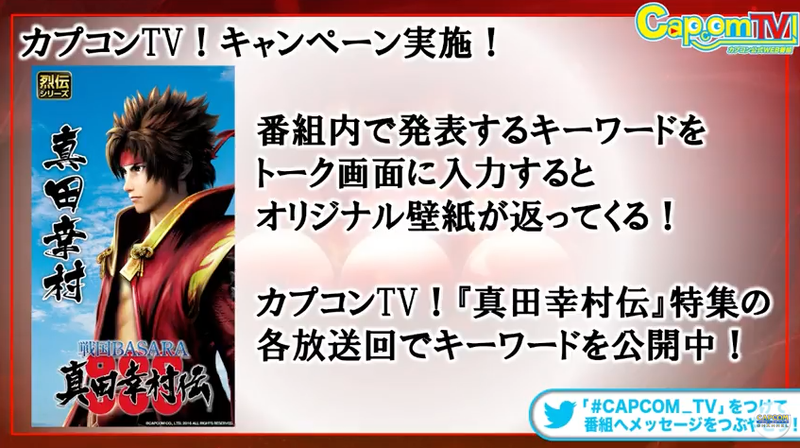 They kindly put the Sengoku Basara: Sanada Yukimura-den segment near the start this time so producer NonakaP appeared with Ashigaru-kun early in the show. To demonstrate the game they started from the very first chapter so we got to see the stage playing out. It has already been described several times and shown in clips so there weren't any surprises, but I confirmed a few of the mission objectives for my Reference Materials master post. They also showed off the Secret Backstory: Bontenmaru's Daily Life mission which is a straightforward duel against Kojuurou. Finally, NonakaP took Yukimura through a few of the Sanada Trials and showed us the Style selection screen long enough for me to note down some more stats from some of the Styles available. I believe I now have most of the details of every basic Style in the game - it looks as though each character has 15: 13 basic, one elemental, and one personal Style. I'll update my Reference Materials later with the full chart (which is actually going to have to be two separate charts as the amount of data is a little overwhelming). Today's smartphone wallpaper giveaway on LINE used the keyword 観てね！ which unlocks this fetching CG artwork of Yukimura against the sky. Going back to catching up on news from the past few days, the official website updated with a new section for another entry in The Action Of Sanada Yukimura-den behind-the-scenes documentary series. The second tab on the page focuses on story cutscenes from the game, and features a pair of video clips showing the game's rarely-seen director Tanaka Toshihiro talking to Sonomura Kensuke, who directs the cutscenes. The first clip is mostly a straightforward interview, introducing their roles and how the cutscenes transition from paper to CG. The problems of dealing with the series' outlandish weapons when real actors are involved were mentioned once more. 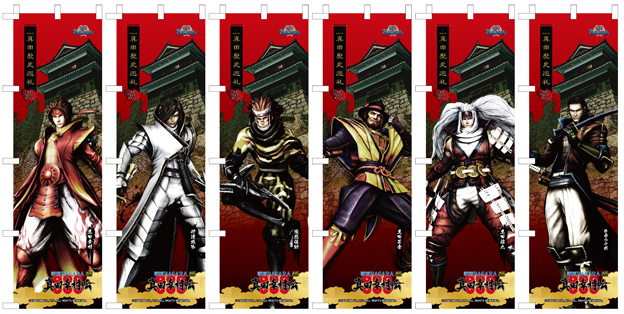 A Shinshuu Ueda x Sengoku Basara tourism tie-in event will be held from 20th August to 4th December 2016. 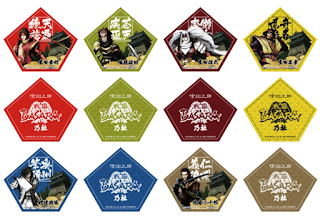 The free Shinshuu Ueda: Sanada Historical Pilgrimage ~Sengoku Basara Stamp-Gathering Journey~ campaign will encourage visitors to the Nagano region to pick up a stamp card and collect stamps at various tourist attractions, then complete a questionnaire. 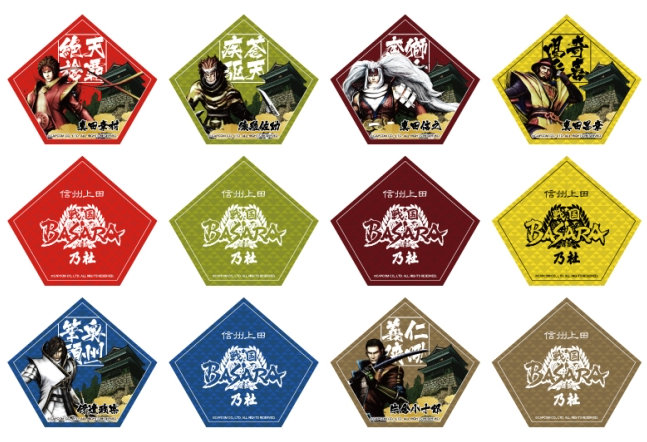 Naturally, there are some special rewards available to entice fans of the series. The official website for the new campaign is here. If you're in the Shinshuu Ueda area, it sounds like a fun activity! hurry up August 25 , gonna be a long week for me. I saw website's actualization, and Chapter 9 and 10 seem to be gorgeus and fantastic! By the way, from the lastest promotional videos and images, I guess that in Chapter 9 you don't only control Yukimura, but also Masamune (DLC costumes video), Benmaru and Bontenmaru (the game's facebook page). 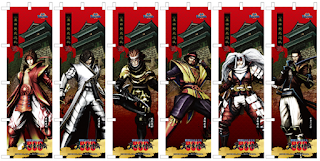 Anyway, I think this game would be one of the most fun of Sengoku BASARA's series, since it has a cool story, various modes, and fun mechanics and gimmicks. Sorry, my guess from Benmaru and Bontenmaru is because what I saw in the website page.